Posted on February 7, 2014 - Get free updates of new posts here. So you’ve build a great website full of content, mastered SEO and the visitors are trickling in. You only have one problem – you aren’t making money from it. But where do you start? Well firstly, this article is talking to sites that are purely set up to make money from content – think online magazines, news publishers or even small do-it-yourself gardening guides. If you have a website for your business and you are regularly posting content to a blog, this article is not for you, as you have already monetised your website in the form of generating leads or eCommerce sales and adding advertising to your content will likely hurt your main website focus. Banner advertisements can be placed throughout your content or in your design and are one of the most common forms of advertising online with the first banner ad going live way back in 1994. There are a range of banner sizes and shapes including square, vertical and horizontal banners. Depending on the network they come from the banners could be a static, animated, interactive or even be playable video banners. Google Adsense – easily the most popular monetisation method throughout the internet in which Advertisers place ads (either banners or text ads) on the Google Adwords Display network which are then shown on publishers websites. Publishers are paid per click generated and get around 68% of the Advertisers bid, with Google taking the rest. The ads from Adsense are contextually targeted meaning that the ads match the content which improves click through rates and earnings. Google are masters at optimising these ad units to generate the highest revenue so this is a great first option to monetise your content. Buy Sell Ads – the most popular alternative network to Google Adsense which is essentially a marketplace where buyers of ad space can meet sellers of ad space. After signing up as a publisher you can put details of your website up and set the pricing in which you want to charge to advertise on your site, this then allows advertisers to buy this space from you for a fixed onongoing time period. This type of monetisation works well for large sites where the return from Adsense is low per page view. Self Sold Ad Spots – the highest value and usually most profitable form of banner advertising is ads generated through your own hard work or sales team. A good example of this is one of the major publishers in New Zealand, this news site charges anywhere from $30-$60cpm (per thousand impressions) to advertise directly on their website with this space also available through the Google Adwords network for an effective cpm of just $2-$3 – a big difference when sold direct. With a lot of effort and some good sales skills you will be able to find advertisers willing to advertise on your site at higher rates than automated banner networks however any time spent on sourcing these advertisers must be weighed against the increase in profits. Along with, or instead of banners ads you can also monetise your website with link based advertising. This form of advertising takes different keywords and phrases in your content and turns it into a link or mouseover effect which is actually an advertisement. This is quite an unobtrusive form of advertising for your visitors but can imply an endorsement of a linked product or company. Skimlinks – this link based advertising option gives you access to 18,000+ affiliate programs through their easy to use and automated linking system. Essentially, you install a simple code on your website and Skimlinks take the normal links in your content and automatically replaces it when it can with an affiliate link to that product or website. 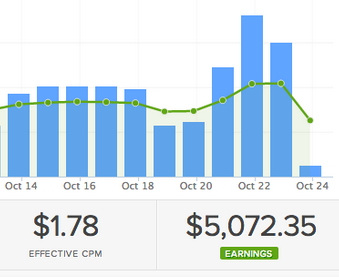 Each time one of your website visitors clicks a link and ends up purchasing, you get paid a commission. Infolinks – one of the first forms of link based advertising, when installed the Infolinks system scans your content in real time and double underlines your most popular keywords. Once a website visitor mouses over the keyword they are then shown an advert related to that keyword with revenue earned by the publisher from views and clicks. 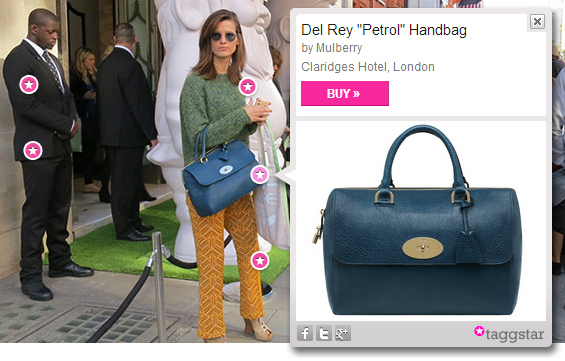 An example Infolink ad which blends into your content. An affiliate program is essentially where a company (aka the merchant) pays you for sending them a website visitor that later converts on their website. The conversion type may be a sale, a lead or even a signup and the Publisher (aka the affiliate) is usually paid per signup, or a percentage of the total sale amount. Depending on the merchant program the affiliate may be able to show text links, banner ads or both on their site to advertise the product or company. Clixgalore – an affiliate marketing marketplace which has a large number of New Zealand merchants signed up including Vistaprint, Clearly Contacts, Hallensteins and many more. These merchants have different offers and require you to signup and be vetted before sending them traffic. The offer and company that you decide to join must complement your site and current website visitors to ensure a high chance of delivering sales. You can be signed up for multiple affiliate programs at any one time so can vary your offers based on the content they will appear next to or in. Clickbank – Along with physical products and leads there is a huge marketplace of digital items which are bought and sold on the internet. From eBooks or Credit Checks these digital products have huge profit margins for the merchant and they therefore offer very generous commissions for affiliates willing to sell their products. The Clickbank marketplace lists thousands of merchant programs you can join so it is worth checking out to see if a digital product would suit your website visitors. Individual Companies – there are a huge range of companies that run their own affiliate programs, some of these programs will be better than others so its a good idea to search and find all appropriate programs and then test them against each other. A good example of large programs you could try are Amazon and Apple who each offer commissions when selling their products. Apple’s affiliate program which pays you for every successful sale sent to them. Like selling your own banner advertising, selling your own products or upsells online is usually the most profitable way of monetising your content when done correctly. The options are unlimited and could be a physical product which you deliver or a digital based upsell. eBooks – As a content producer you or your team likely excel at producing quality content so one of the easiest and best things you could sell on your site is even higher quality content in the form of an eBook. An eBook is likely to be 30+ pages long and should be content your visitors will be interested in which is usually not available or hard for the visitor to source themselves for free. A good example of this is if you owned a website helping people buy and analyse used cars you could upsell them an eBook for a nominal amount (usually under the $10 mark) which gives them information on ‘how they can save thousands buying used cars from Police auctions’. The key to selling enough eBooks is that the topic and content inside the eBook is sought after and valuable enough for someone to be willing to pay for so make sure a lot of time is spent on strategy before the production of the content begins. Paid Access – Newspapers around the world have begun to gate their content with Paywalls which stop you reading their articles after you have read a fixed number of articles unless you pay a monthly fee; the New York Times have had a lot of success with this method. The best part is if you have valuable sought after content you don’t be a big publisher for this to be a viable revenue generating option. You can start experimenting now with a new offering launched by Cleeng which allows you to protect any content on your site and sell access to it either on a pay per view basis or through a metered paywall. Your chances of success in this monetisation method are increasing as the public are educated and trained to pay for the content they like online by the publishing industry so its definitely a method worth testing. Apps – Like creating eBooks that complement your website content you can also create iOS or Android apps for smartphones which are useful and someone is willing to pay for. An example of this is a website about medical issues who may create an App which helps people self diagnose with advice whilst they are travelling overseas with the app sold for a nominal amount to improve conversion rates and encourage the app to go viral. 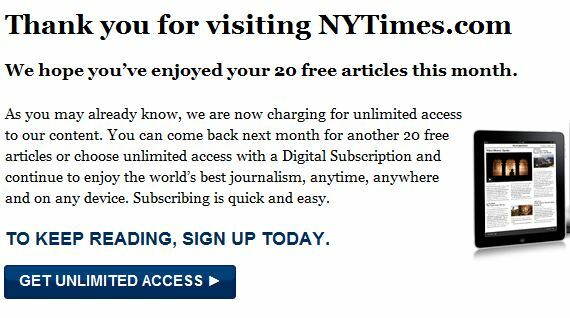 The Paywall used by the New York Times to sell digital subscriptions. 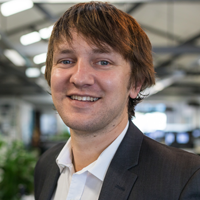 SpotX – this marketplace allows for the monetisation of your video content with advertisers paying to place both in-stream and in-banner ads into your content. Taggstar – allows monetisation of the images on your website by making them interactive with certain sections clickable or mouseover ads. For example if you had a photo of the Grammy Awards on your website the fashion worn by a celebrity may be clickable with publishers paid per sale generated. Adf.ly – monetisation of your outbound links by using Adf.ly which is a URL shortener which send visitors clicking out from your website to a page with an advertisement before redirecting them to the correct outbound link with Publishers paid per visitor. Taggstars innovative way of monetising your image content. I began this article planning to recommend you the best 2 or 3 options but as you can see I have gone far above that! The reason is that every blog, type of content and situation is different and no one monetisation option is going to be the best for you. What is important is that you test some of the above options against each other to see which generates the highest revenue for your blog (preferably by split testing) whilst continuing to look for new methods.